Head over to Fillmore Street in San Francisco for the 57th Annual Juneteenth Festival, celebrating the abolition of slavery in the US. This year marks the 152nd anniversary of the Emancipation Proclamation. The 2019 festival is on June 15. There you'll find dozens of fun activities, including a parade that starts at 11am. Other highlights of this event include a job fair, car show, and a health and wellness fair. You can also watch the fashion show, learn more in the beauty fair, or find out about local programs at the community information booths. If you love live music, then head over to the four stages of entertainment. Here you can enjoy motown, soul, jazz, rhythm & blues, and gospel. You will also find performances of Caribbean soul, neo soul, zumba, and reggae. Bring the kids along too! This year they can enjoy pony rides, a petting zoo, and jumpers. They can also get their face painted and have fun on some carnival rides. Also, don't miss out on the food and beverage booths serving up some of SF's finest grub. 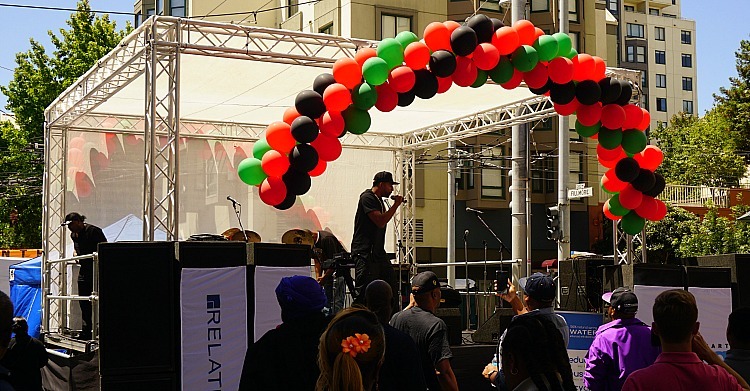 All events for this year's Juneteenth Festival in San Francisco are on Fillmore Street between Post and Turk Streets from 10am to 6pm. The best way to get to the Juneteenth Festival from other parts of SF is by Muni bus. You can take the 22, 31, or 38. Take BART (SF's subway system) to the Montgomery Street Station. Walk to the nearest bus stop to pick up the 38 and take it to the corner of Fillmore and Geary Streets. The bus is the easiest option from the North Bay. Take the 70, 80, or 101 to the corner of Lombard and Fillmore Streets. Head to the southwest corner and pick up the 22 Fillmore. Take this right to the festival (get off near Geary Street). Take BART to the 16th and Mission Street Station. Exit BART and find the 22 bus heading west. This will take you to the southern end of the Juneteenth Festival. If you decide to drive to this year's Juneteenth Festival, you have a few options for parking. The street parking here is a little tight, but you might have some luck to the southern end of the event near McAllister. There are also two parking garages nearby. One is in the large apartment complex between O'Farrell and Eddy Streets. However, a better option is to head north to the parking garage in the Sundance Theater at Post and Fillmore. Both will probably fill up though, so get there early if you plan on driving. North Beach Festival: One of the largest festivals each June in SF is the one in North Beach. During this two-day event, you can listen to live music, mingle with locals, and enjoy chalk art from local artists. Click here to learn more about this festival. Father's Day Activities: Do you want to make Father's Day even more special this year? If so, check out this year's top events on Sunday, June 18. Options include cruising around the bay, attending a baseball game, or watching documentaries at the SF Doc Fest. Click here for the entire list. SF Giants Baseball: Catch the Giants in action this June as they take on teams such as the Arizona Diamondbacks, Los Angeles Dodgers, and the Colorado Rockies! There's nothing like watching these World Champions play a home game at their waterfront Oracle Park (formerly AT&T Park). Click here to learn more. Discounted Tickets: Another place you can look for events is on Goldstar.com. On this discount site, you will find tickets for up to 200 SF and Bay Area events at up to half-off the full retail value. Click here for their latest list of tickets. SF Doc Fest: This annual film festival is always in June. For two weeks, you can watch dozens of new documentaries from up-and-coming artists. It a great place to learn more about our large and ever changing world. Stern Grove Festival: Each Sunday afternoon from mid-June to mid-August, head over to Stern Grove Park for their annual free music festival. This event features both local artists like the SF Symphony to big name acts such as Smokey Robinson. All shows start at 2pm. Click here to learn more. Yerba Buena Festival: Another free, fun festival that lasts all summer long is the Yerba Buena Festival in downtown SF. Every week, they feature a number of performances from kid-friendly shows such as magicians to up-and-coming live music performers. All shows are in the Yerba Buena Gardens. Click here for this year's schedule. Fillmore Jazz Festival: The Fillmore Jazz Festival is also in this area of San Francisco. Usually set over Fourth of July weekend, this event offers free, live jazz music as well as gourmet food, arts & crafts vendors, and other fun activities. Click here to learn more about this year's festival.